At Gina’s Pizza we understand that whether you are building an organization or making a pizza, you are only as strong as your weakest link. Therefore, we only use the finest ingredients in the preparation of our dishes. We are now and have been from the beginning, committed to making our food stand out from the crowd. It is this commitment that has kept us going strong for over forty years. Here’s to the next forty! Near Palermo, Sicily, where Gina grew up, slow cooking was the only kind of cooking, Delicious food wasn’t just a part of life, it was life. We operate our kitchens much as Gina and her family did back home in Sicily. 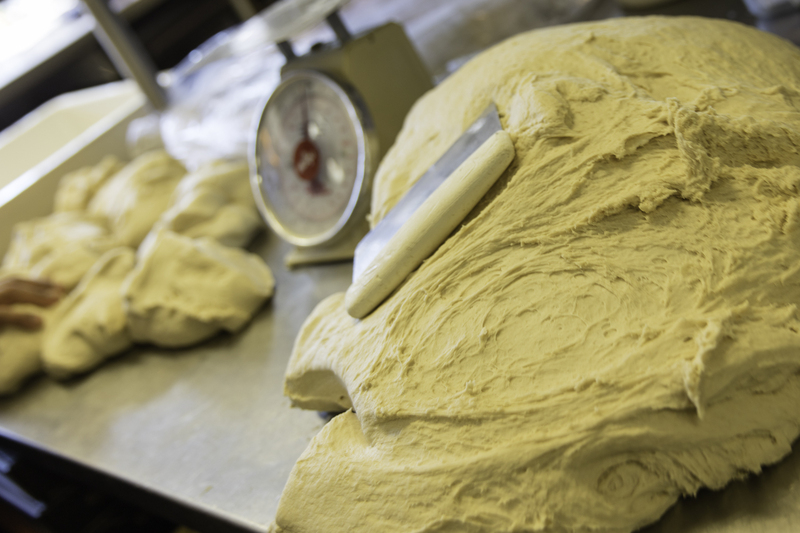 We start with the freshest ingredients, mix our dough from scratch, and stir small batches of specially seasoned sauces daily. Choose from our ORIGINAL, THIN, TRADITIONAL and WHOLE GRAIN crusts. Choose your crust: 1–Original or Thin, 2–Traditional or Whole Grain. Gluten Free crust availalbe in Medium size only. See allergy alert on to-go menu. 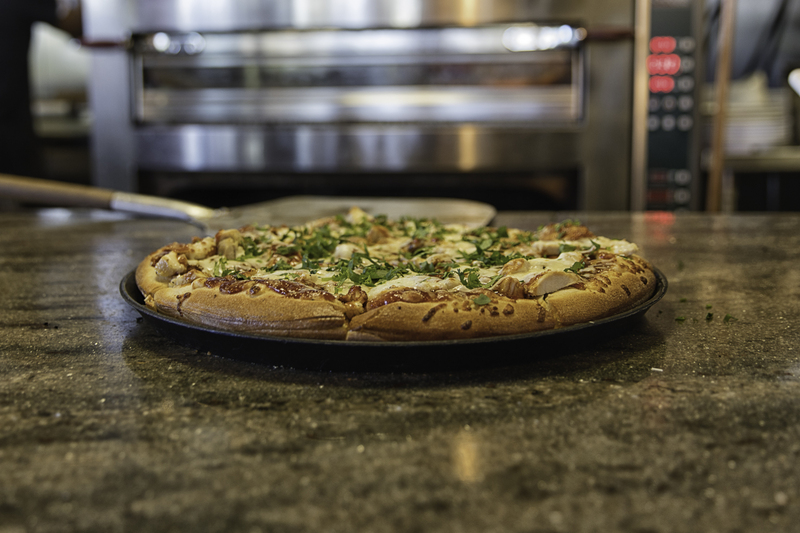 Sicilian chicken, house-made barbeque sauce, smoked gouda, mozzarella, red onion and fresh cilantro. Creamy mascarpone, mozzarella, ricotta and romano cheeses, crisp bacon and rosemary. Amelie's favorite! Roasted garlic alfredo sauce, Sicilian chicken, fresh spinach, roma tomato, red onion, mozzarella and feta cheeses. Freshly-made pesto sauce, breaded eggplant, mushroom, tomato and mozzarella. Alita's favorite! The original Gina's favorite: pepperoni, sausage, mushrooms, roasted peppers, red onion, freshly-made pizza sauce and mozzarella. Roasted garlic aioli, fresh roma tomatoes, mozzarella fresca, fresh basil and E.V.O.O. with freshly-made pizza sauce and mozzarella. Crisp bacon, Canadian bacon, freshly cut pineapple, freshly-made pizza sauce and mozzarella. Roasted seasonal vegetables, fresh spinach with freshly-made pizza sauce and mozzarella. Pepperoni, Italian sausage, crisp bacon, Gina's meatball and pastrami, roasted garlic, freshly-made pizza sauce and mozzarella. Gio's favorite! BiggaSlice and BiggaPies are available for dine in or pick up only. Each pie is baked to order. Each slice is made to order, so please allow up to 10 minutes. Check for availability. 28" thin crust cheese pizza pie, baked to order. Toppings and Premium Toppings are extra. Each 14" thin crust cheese slice is baked to order. Toppings and Premium Toppings are extra. Please allow up to 10 minutes. Toppings and Premium Toppings are extra. Choose your toppings to add to your cheese slice. All Kid's Meals include choice of: One side–Veggies & Ranch or Kid's Salad with Croutons and One Kid's beverage–Soda Pop, Milk or Apple Juice. Flatbread with turkey or ham, Alfredo sauce, mozzarella and basil (no green stuff on request!). Three cheese raviolis, spaghetti or penne pasta served with garlic bread and choice of pasta sauce: Alfredo, marinara, meat sauce, creamy marinara or butter and cheese. Three house made chicken breast strips served with french fries and choice of dip: ranch, BBQ or marinara. Slice of cheese pizza with one topping. Extra toppings $.59. In Irvine, dine in daily from 3–6 p.m. to enjoy: Discounts on Appetizers • $1 off Beers $4 Off Pitchers of Beer • BiggaSlice and Draft Beer, $8.99 • Pints of Draft Beer, $4.75 • Any Glass of Wine, $4.95. Wine Wednesday Includes Half-Price Any Bottle of Wine • Free Corkage from 5 p.m.–close • Thirsty Thursdays features $5 Off All Pitchers 3 p.m.–close.